Rainstar Capital Group has developed a diverse platform of lending solutions for clients seeking fix/flip/rental financing from $50000 to $20,000,000 requests. 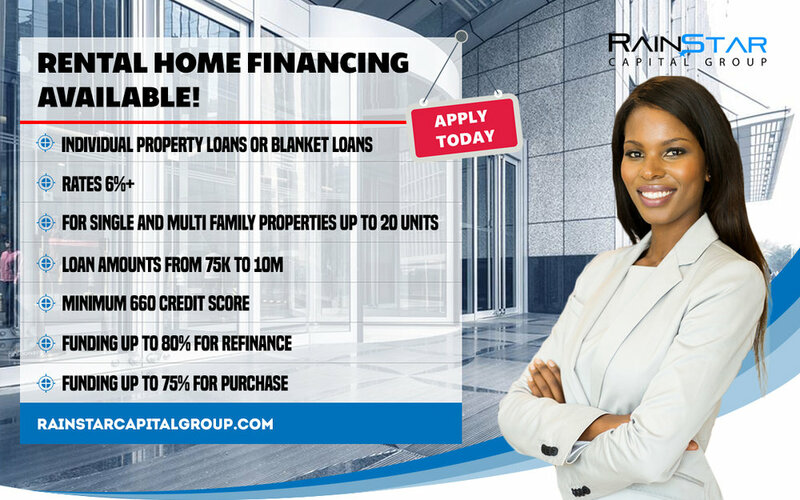 With a diverse base of partner lenders Rainstar Capital Group is well positioned to assist you in financing your fix/flip/rental financing real estate request. * Rainstar Capital Group makes no claim as to the accuracy of these lender programs as the direct lenders and fund managers that work with Rainstar Capital Group, at times change their underwriting criteria and their loan matrices. To the best of it's ability, Rainstar Capital Group updates these lender profiles based on info provided by the lenders. By applying for any program, the client acknowledges that the programs, interest rates, LTV's, etc. are subject to change based upon the lender's underwriting criteria. Lender Description: Lender is experienced in the Fix/Flip market. Geographic lending areas: 40 States plus District of Columbia. All states except: Alaska, Arizona, California Hawaii, Nevada, North Dakota, Oregon, South Dakota, Utah, Vermont. Lender Description: Single property loans to both novice and seasoned investors. Lender Description: Lender offers many product options. Lender Description: Lender has a long list of successfully funded clients in the fix/flip/rental space. Lender Description: Rental Property Loans up to 7 years. Lender Description: Fintech lender providing single family rental and fix/flip financing. Geographic lending areas: Licensing required: AZ, CA, NC, NJ, NV, NY, OR, No licensing required: CT, CO, FL, GA, IL, MD, MI, MO, OH, PA, SC, TN, TX, VA, WA, WV. Lender Description: Lender is a nationwide, direct private lender providing short-term loans and million-dollar lines of credit to facilitate experienced Speculators, Investors & Home Builder’s acquisition including rehab funds on single family, 1-4 unit properties with the purpose of rehabilitation and resale in the retail market place. Lender Description: Major fix/flip/rental financing provider. Geographic lending areas: Nationwide except: CA, AZ, NV, ND, SD, MN, VT, UT, OR. Lender Description: Popular and season lender. Geographic lending areas: AL, AZ, CA, CO, CT, FL, GA, HI, ID, IL, KS, KY, LA, MA, MD ,ME, MO, MS, MT, NC, NH, NE, NJ, NM, NY, OK, OR, SC, TN, TX, UT, VA, WA, WI, WV, WY (licensed broker required for AZ, KS, MO, MT, NE, OR & UT) Lending in Chicago, Baltimore and Hartford on CBC basins only! Lender Description: A private money lender specializing in the financing of non-owner occupied residential investment properties. Lender provides Mortgage Brokers and Real Estate Investors with a fast and cost-effective funding source for their real estate investment needs. Lender Description: Leading fix/flip/rental financing firm specializing in fast closings for strong borrowers. Geographic lending areas: INELIGIBLE States: Alaska, Hawaii, Idaho, Maine, Montana, North Dakota, South Dakota, Vermont, Puerto Rico, U.S. Territories including Guam and, Virgin Islands. Lender Description: Lender provides short-term funding for the acquisition of non-owner occupied 1-4 family residential properties. Lender Description: The growing construction lender for builders, developers, and investor-GC’s doing 1 to 1,000 houses a year. Lender Description: Rental portfolio loans and single asset rental loans providing liquidity and long-term peace of mind to owners of stabilized rental properties. Lender Description: Hard Money Lender providing loan programs tailored to unique needs. Geographic lending areas: Nationwide but primarily in California, Washington, Arizona and Oregon.